This very well might be my Christmas card this year. If you’d like to win a free session with MB Shaw photography, click right over here. I wrote this series during what might have just been the most chaotic, grace-filled 31 days of my life. It’s taken my 31 days to realize how much I love my home and my community and my people. 31 days to realize that I started this series because I thought it would drive traffic to my blog, but in effect it really only drove me to this blog, each and everyday in an effort to make something out of times there was invariably nothing. 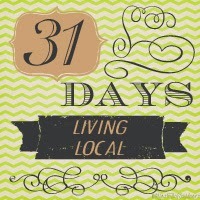 31 days to believing that I am a writer and not the host of things I keep pretending to be. 31 days to recognizing that my heart is here, for this community and my backyard and these people who make up my everyday ordinary. 31 days to discovering that the biggest differences I want to make in this world are the smallest occurrences: the hot meal, the baby holding, the laundry washing, the grace-giving. Because I am learning that in living local, I am making big impacts on a small scale. You can, too. If you’re overwhelmed by all the offerings and needs and projects swirling around your world, I encourage you to step back and take some time to just ponder where you are when you feel most passionate. Ironically, I had to get away to see how much I want to serve just right here. Living Local can be about more than just supporting small businesses and farm-to-table movements. When you’re truly living local, you’ve found your sweet spot, like Sarah Mae told me last week. You’re living and serving right where you belong. And that sweet button? That was made by my friend Andi. She gives great hugs, wonderful tutorials, and has her own etsy shop where she makes jewelry and other fun items like amazing all-natural chapstick. Check her out here or here if you’re a home educator.